Saka new year is a Balinese new year based calculations on the Balinese calendar. Saka New Year in Bali is often referred to as Nyepi Day. Unlike the other new year, which is celebrated with a festive and party, when Saka New Year, the Balinese people celebrate it with serenity. Saka New Year which this year has been entered into in 1937. Saka New Year 1937 will take place on March 21, 2015. The celebration of the New Year of Saka has several series of ceremonies ranging from a few days before the new year. All the rituals and ceremonies before the new year aims to raise the balance of the universe, as well as neutralize any negative effects that may interfere with all of life, so in celebration of Nyepi universe has become calm and free from negative influences. Nyepi 2015 will take place during the rainy season. When Nyepi Day is estimated rainfall will occur with very dense. Ogoh-ogoh festival will be drenched by rain. These conditions will damage the ogoh-ogoh and disrupt the festival. Ogoh-ogoh will be damaged and heavy rain as it absorbs water. Read also: Ogoh-ogoh parade 2015 will take place on March 20th. Ogoh-ogoh is a paper doll with a frame made of bamboo. But this time ogoh-ogoh was created using styrofoam. Ogoh-ogoh made by youth groups in a village. Each village consists of several groups of youth. They make ogoh-ogoh with pleasure and joy. Ogoh-ogoh is the embodiment of youth artwork. So ogoh-ogoh not just a suggestion customary rituals and traditions, as well as the embodiment of youth excitement to welcome Nyepi Day in Bali. Read also: Nyepi Day 2015. When Nyepi Day, all activity stopped. Foreign tourists in Bali must obey all the rules that apply during Nyepi Day. All the people were not allowed out of the house, may not go to use the vehicle on the road. That may be roaming the streets is just a security officer. Pecalang is customary security officers in Bali. Its mandate is to maintain a conducive environment in order to remain free of crime during Nyepi Day. Ogoh-ogoh parade of the most festive in the city of Denpasar. In Denpasar, Parade ogoh-ogoh 2015 will be the most colorful, vibrant, and crowded by the audience. Koda Denpasar has always been a tourist destination by tourists during ogoh-ogoh parade took place. In this city all youth groups make ogoh-ogoh with a very large and attractive. With a variety of themes and sizes ogoh-ogoh size is very large. 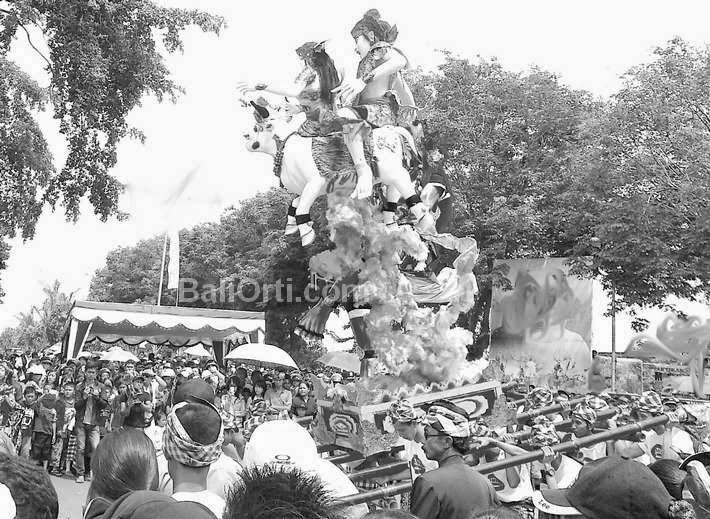 Read also: How to make Ogoh-Ogoh, Ogoh-Ogoh 2013, Ogoh-ogoh 2014 parade.